Wow! That Dragon sure was hard to kill. You must be tired. 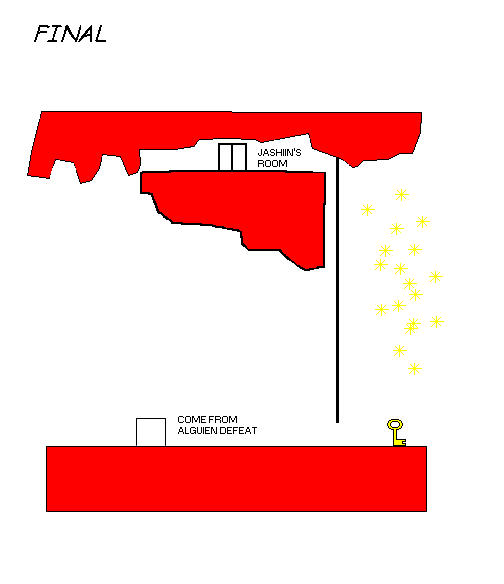 Cut the roof with your sword where the red rectangle lies in the image below, and drink the blue potion that falls down. Now you've gotta get to the nearest town. Go right and climb down the vine. Try falling down the chasm. You can't because, as fate has it, this level has also got some air currents. 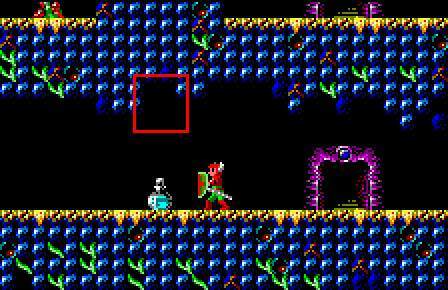 Go to the other side of the chasm and you'll see the door and a slime monster. Go through the door. A word of warning: do not go into the hut with the woman who says "Help...". You should be smart enough to figure out that she is probably tricking you, otherwise, she would have told you why she needed help. We'll deal with her later. Otherwise all the other people of Pureza town are friendly. Chat with them and get the low-down on all the latest gossip. You'll find out that you'll have to hunt for some lion head's key and a guy also gives you some vague directions. You'll also be needing the legendary Sword of the Fairy Flame to terminate Jashiin. Visit the Sage (of all sages) and 'See your Power' and also listen to her knowledge. The bank's got a pretty good exchange rate, but the nearby town of Esco has even got a better one. You, really don't need money to buy expensive weapons anymore, just to repair your shield or buy some magical items. So there's no use hoarding lots of money. You can exchange your almas now. Repair your shield. You already have the state-of-the-art weapons, so no need to buy anything from the weapon shop. Ok, now we need to find a lion's head key, a legendary sword and get some free shoes in the bargain! Let's go! Exit the town. Yup, yup, yup. You've fallen between the two towers and have got the lion's head key. . Now you've just gotta find a door for it. But first, let's go back to the town. Fall down to the left and jump across the vine. Don't go on the moving platform. Just fall down, go left, fall down, kill the slime monster and enter the town. Talk to the woman who lost the lion's head key and she'll confirm that you've got the right one. Repair your shield, deposit your gold, record your experience and go to the woman who needed 'Help'. Hmm... that's odd, where did she disappear to? Anyway go into the hut. So it was all a darn trick! Well, we'll make the best of the occasion. Now you know what this building is here for. You can try telling it to the old man standing next to you, but he's too busy telling you his part of the story. Oh well, we'll just keep it our secret. Now, you could go back to Pureza town, or try making good use of that lion's head key. Remember the door with the green symbol, which you were never able to open? Maybe it'll work there. So, leave the town from the east(right) exit. Fall down right, destroy the armour-piercing bird and fall down to the right again. There's the green door. Try opening it. Aha! It opened. So much for the wise guy in town telling you that the 'door bearing the green symbol just cannot be opened.' Ha! Go in. You must be somewhere in the middle of the caverns. This place is completely made up of gold! Go left and climb down the vine. A chest! No, 2 chests! Open each one and get your prizes. Those Feruza shoes look beautiful! What are these shoes for, you ask. Well, firstly wear them. Now, try to jump. Wow. These shoes defy all laws of physics and gravity! They must be made of rubber which enables you to jump higher than usual. Open the other chest and get your Enchantment Sword . Ya, ya, I know what you're saying. "Enchantment Sword??? Where's the Sword of the Fairy Flame or whatever it was called????" Well, just like the guy in Dorado called the Silkarn shoes the 'Shirukanoo' shoes, just like that this sword is more popularly known as the Sword of the Fairy Flame, although it is actually the Enchantment Sword. There, that settles it. (Or does it? Check out the Translations section for some more details). You've gotta be really happy now, 'cause you've got the best sword a man can have. This sword makes the Illumination sword look like a mere axe. This baby has got enough power to slice through those pesky-undestructible-red-slime-creatures in the Graveyard (5th) level in one go. Use the weapon. It looks as if it's made of gold, or it just might be the peculiar light that it's supposed to give off and it's longer than any other sword. You can't get a better bargain than this! (I'd like to clear one more point here. Although the guy in Pureza said that this sword can vanquish any foe in just one blow, it can't. It won't finish off Jashiin in just one blow (although it finishes off all his minor subjects quickly). The guy in Pureza has certainly got some bad habit of spreading wrong rumours.) Enough with the praising. 'Tis time to get revenge on Jashiin. Jump up and thrust your new sword into the wall in front of you. It crumbles away. This must the fake wall in the middle of the caverns that the girl in town was talking about. Keep breaking the wall. Soon the ground beneath you will collapse. Fall down to the right and then jump up onto the ground to your left. Climb the vine and open the 3 chests to get your credit for finding the Enchantment Sword and Feruza Shoes: 3000 gold. It just doesn't get any better than this! Climb the second vine and if you're thirsty, drink a potion in the chest, or go trough the nameless door. You're back! Let's go to the town first. Fall down to the right and keep proceding right, climb down the vine and across the chasm. Stain your brand-new sword with first-blood of the slime creature. Ha, ha! Now enter Pureza. Repair your shield and deposit your remaining dough. Record your Experience. The lady near the Sage's hut will pray for your safe return. So you better make use of that prayer and head out on the road to Jashiin. First of all kill the slime monster on the right. Then procede left till you reach a slope. You'll have to wear your silkarn shoes because the slope is too high. 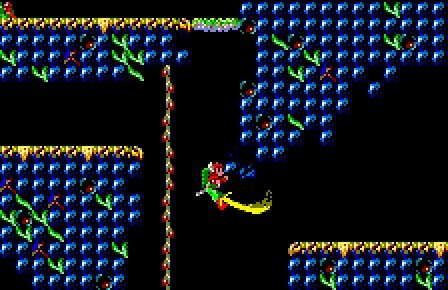 Scale the slope and wear your Feruza shoes again and kill the slime monster at the top. Keep going left. Hmm... a locked door. We'll have to find a key. Kill the other slime monster and then go down the slope. 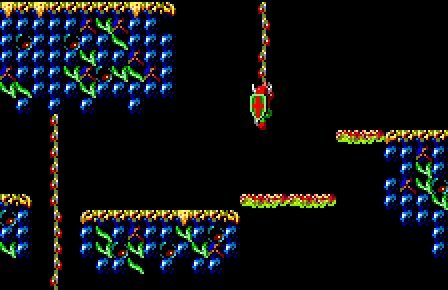 Kill the crab that falls from top and the attacking flying jellyfish (you need to hit the flying jellyfish on the head to finish him off). Then fall down and kill the slime monster there. 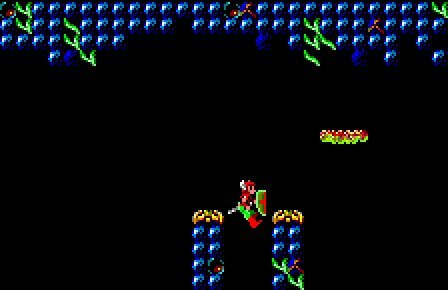 Jump across the chasm to your right and terminate the other slime monster. Jump straight up and you'll be able to catch hold of the vine with your new shoes. Climb to the top, extinguish the 2 slime monsters and then procede right. Jump on anyone of the platforms which will take you to the bottom floor. 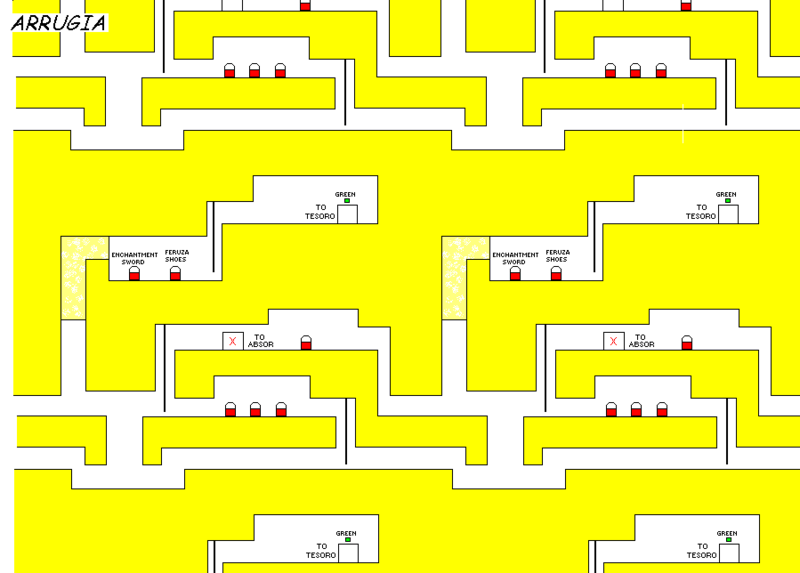 Destroy the 2 slime monsters and then go into the door on the higher ground to your left. Now kill that slime monster and fall down to the left. Climb back up the vine and keep going left killing all creatures till you reach the elevator. Jump up onto the higher ground and climb the vine to the top. Get off to the left, kill the slime monster and go through the door. Go left killing the slime monster and stop at the edge. Wear your pirika shoes. Now say Geranamo and jump down. You'll land in some burning hot coals, but not to fear, the Pirika shoes protect you from all such life-threatening situations. Make your way out for the hot coals to the left and climb the vine. You see the key, so take it. Now hitch a ride on the platform up ahead and climb the vine from it. If you see a whole host of monsters waiting for you up there, then you can use your Aqua or Guerra power to wipe them all out in one go, or you could always rely on your trusty sword. Keep going right and this time climb down the vine. 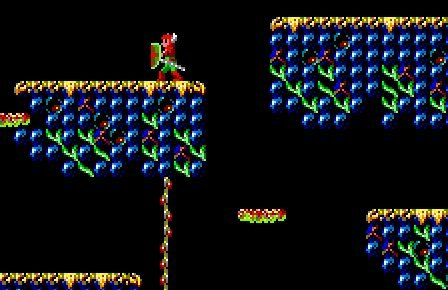 Hang at the bottom of the vine and when the moving platform is below you, fall onto it and then walk onto the second moving platform and ultimately climb the vine leading to the top. Once you reach the top, wear your Feruza shoes again, kill the slime monster and enter the purple door. 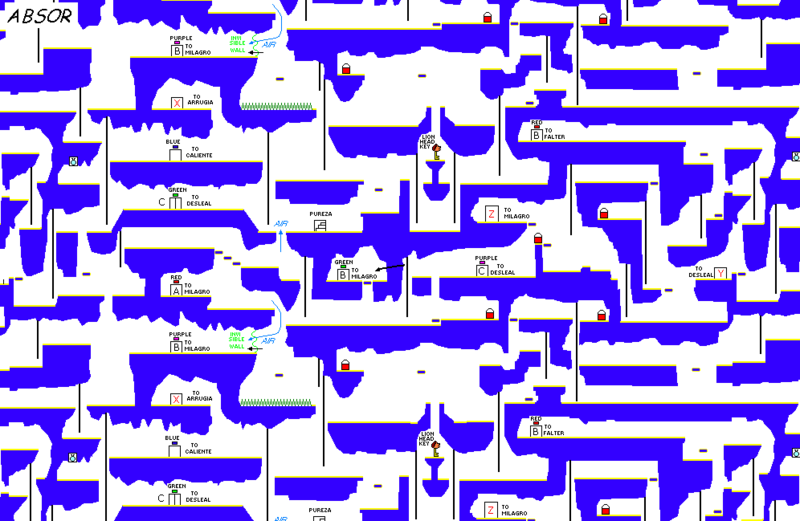 Kill the slime monster to the right and then fall down there. Go through the purple door. A flying jellyfish will give you a warm welcome. Move a bit to the front or back and then jump and hit him on the head. Go left and fall down. There should be a couple of slime monsters waiting for you down there and a blue flying creature too. Get all their almasses. If you're looking for some gold, then keep going left till you reach a vine. You will find 500 gold at the top. Then come back here. Now, climb down the vine in front of you. Jump across the vine to the area on the right. Keep going right, down the vine, across the air current and into Pureza. Repair your shield with the gold you have and deposit the rest of it. See if you can increase your power and record your experience. Okay, now it's time to embark on the journey to discover the little, peaceful town of Esco. Exit the town. Go left, across the air current and scale the slope with your Silkarn shoes. Kill the slime monster and open the door with the key. Go in. 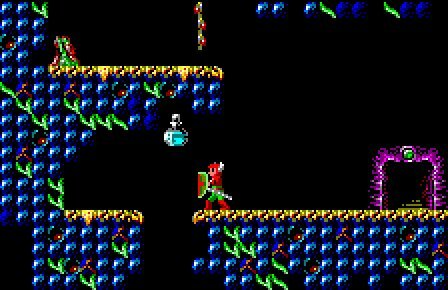 If you want to restore all your health with a blue potion then go right, kill the slime monster and reach the dead end. Hit the ceiling above you, i.e. where the red rectangle lies in the image below. Now simply keep running to your right, killing the four crabs that come in your way and board the elevator at the dead end. Move it to the top. You will see two moving platforms. You will have to board the first one in a crouched position and then hitch a ride on the second one and then get off on the ground on the other side. If you fall down, then make your way back to the green door and then come back again, so that the elevator is lowered. Once on the other side, climb the vine and get off to the right. 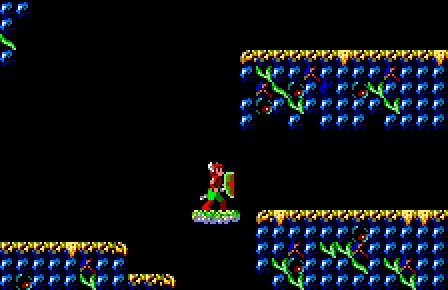 Kill the two slime monsters and jump and catch hold of the high vine (make sure that you are wearing your Feruza shoes at all times. Only wear the other shoes when I tell you to). Thanks to the Freuza shoes, you didn't need to hitch a ride on the 3 moving platforms to get on the vine. Anyway, climb almost to the top and get off to the left (while falling from the vine to the left, keep the button pressed otherwise you will fall down). Now hitch a ride on the other moving platform and climb the vine which comes in the way. Climb to the top and get off to the right. Kill the slime monster and stop near the higher ground near to the vine. Now simply jump towards your right and an air current will transport you to the higher, otherwise unreachable, ground with the purple door. If you are unsuccessful, then climb the vine to the top and get off to the right. Either way, you will be transported to the wonderful purple door. Neat, eh! Go into the purple door. Kill off the two crabs that try to attack you from the right. Now go left and fall down onto the lift. Go right and get the 1000 gold. Now go back to the elevator and raise it to the top floor. Now, walk to the edge, that is near the vine, but do not climb the vine. 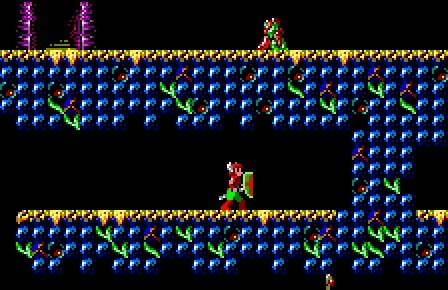 If you observe, you will be able to see that the slime creature on the other side of the wall is able to hit you, right through the wall. That can mean one of two things. Either your eyes are playing tricks on you, or that is a one-way wall. Try it, and jump into the wall. You should be able to go to the other side. Damn, this last level has all the elements of the previous levels. You better watch out! Kill that helpful slime monster and go into the green door. Note: We are very near Esco now, and (here's a secret) there's a church in Esco. So you can freely use your Guerra or Aqua to terminate pests, and get to restore your power for free in the town!! Fall down into the place where the potion falls and you should land on an elevator. Kill the crab that comes from the right. Continue right, killing the two slime monsters and fall down. From here move left and get the 1000 gold in the chest. Now, go back to the right and fall down again. Now step on the platform which will take you to the bottom floor. You will see 2 slime mosnters. Slice 'em up. Fall down to the left to get 2 additional almasses. Keep going left and jump onto the higher ground where you get two more sitting ducks. Go left and climb the vine. 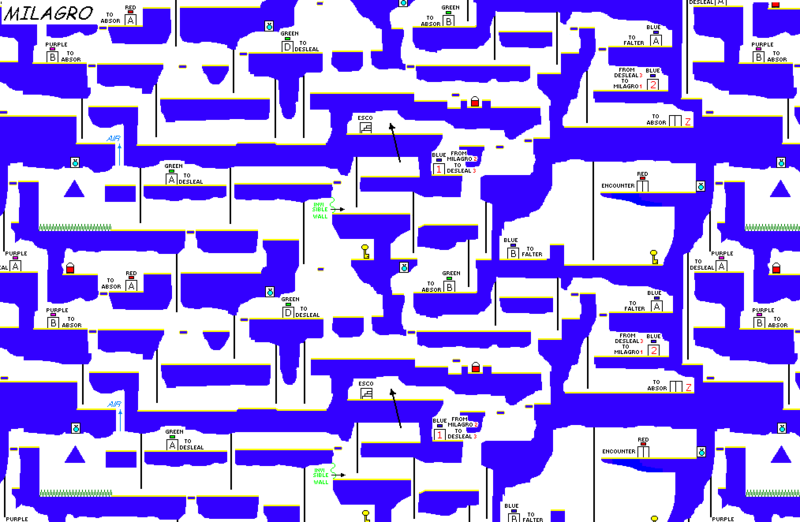 Get off to the right and kill the slime monster. You should have spotted Esco up there. But how do you get there? There's no vine or anything. Well, there's only one possible solution. Invisible air currents + one-way walls = road to Esco. Confused? Stand about here and jump towards the ceiling. See what I mean! An air current near the ceiling will transport you to the upper level, thanks to the one-way ceiling! Kill the slime monster welcoming you. You see it, you feel it, you hear it, you sense it, you know what it is, it is..... Esco!!! Go in! This is the last town you'll come on your way to Jashinn's destruction. This is the most friendly town, except for two guards who will try to "weaken your will". Otherwise everyother guy in the town is a wise guy who will give you lots of advice. So listen carefully to them. The only drawback to this town is that it hasn't got a sage, so you can't record your experience or see your power here. Apart from that, this town is excellent. The bank has got a marvellous exchange rate of 1 almas: 8 gold! But you really don't need all that cash now, since there are no better weapons to buy. Money can just be spent on magic items or repairing shield, and you probably have enough money in the bank for that. The Magic shop and the Weapon shop have got all the items right from Muralla Town to Pureza town and at the cheapest prices too! Best of all, this town's even got a church, so you don't have to waste money in some stupid inn. Does it get any better than this?? Exchange your almas, repair your shield, buy any magic items you want to (Jue-en Fruit and Chikara Powder are useful) and prepare yourself for the ultimate battle. Exit the town. Short Note: From this point onwards, the walkthrough is going to take you on a one-way road to Jashiin. BUT, if your 'life' is not full, then I advice you to go back to Pureza and try to increase it at the sage's. You can always make your way back here and follow the walkthrough. However, if you go to Pureza and the Sage doesn't increase your power, then come back here, get the key (how to get it is explained below) and go back to Pureza to 'see your power'. I recommend you to have full life before going out at Jashiin. Although you could beat him without full life, but it just wouldn't be fun! Ok, go right killing the slime monster and fall down to the blue door. Go through it. Go left, fall down and climb the vine. Kill the 2 slime monsters and move forward. Now, instead of going down the vine, stand a little away from the edge and jump to the left. An air current will transport you to the land on the other side. According to that guy in Esco, you have opened a new path by jumping across the ivy instead of going down it. You should be here now. Secret: If you hit the ceiling where the red rectangle lies in the image then you will find a potion which will restore all your health. 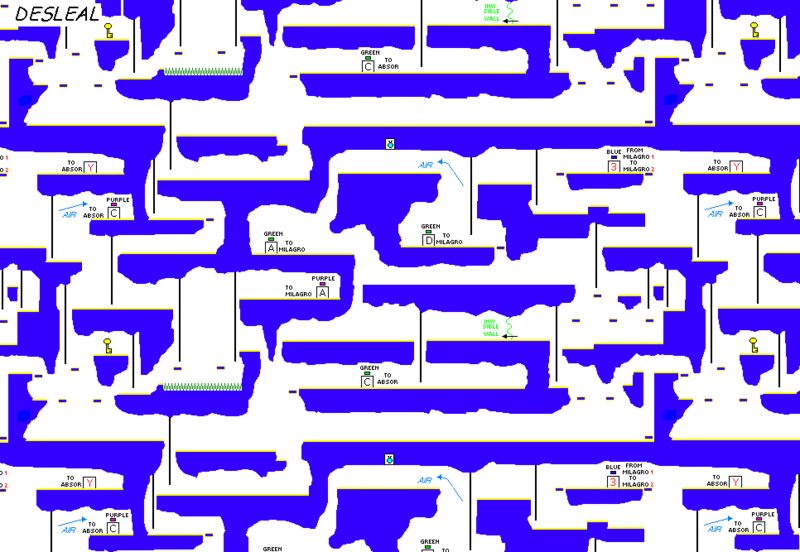 Okay, now go left, fall down, kill the slime monster and the blue flying creature and then enter the green door. Go right and down the vine. Keep moving right and jump over the chasm ahead. Climb down the vine and wait for the moving platform. Hitch a ride on it and get off on the other side. Take the key and retrace your steps. 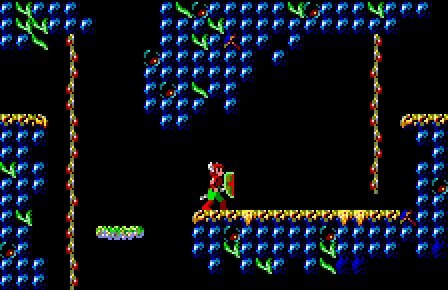 That is get back on the platform, climb the vine jump over the chasm to the left and climb the vine . Now go right and jump onto the escelator. Move it down and fall off to the right. Climb the vine, kill the slime monster jump up, kill the slime monster and enter Esco again. You can make any repairs to your armour that you want. I would also advise you to buy some saber oil and juu-en fruit because now you will be embarking on your journey to destory Alguien and Jashiin as well. Also listen carefully to the word of the wise men. Okay, leave the town now. Go right and fall down. Go through the blue door. Now go through the same door again. Yup that's right. Go in there again. Remember the words of the wise man, "Pay attention to the blue door. It has changed three colours". Go left, fall down and then move right killing all creatures in your path. Open the door with your key and move into the next cavern. Now stand on the ground that is a little higher than the rest and jump to the right. An air current should transport you here. From here run to the right and jump and in mid air thrust your sword. The aim is to crumble the piece of wall that is blocking the escelators path. It should look like this. Now just fall down. Go left, climb the vine and jump onto the moving platform. From the platform jump and catch hold of the vine. Climb up, go right and move the escalator down. The other way to do this is to jump straight onto the moving platform, jump and catch the vine, climb up, go right and move the escalator down. When you are blocked, use your Guerra power to crumble the piece of wall. According to the man in Esco you have fallen from a stone and were blocked by a wall, which you thrust through with your sword and now you are on your way to the abode of Jashiin. Okay now stop the escalator right about here and jump across the chasm. Climb the vine. Move right, climb the vine and jump onto the escalator. 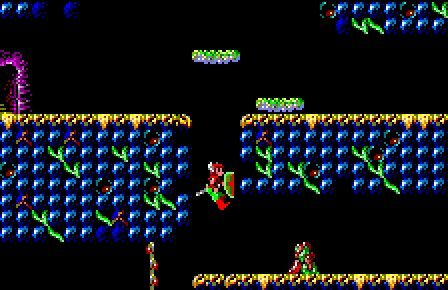 Move up and when blocked by the wall, just thrust through it with your sword. Move up and then jump onto the ground to the left. Hitch a ride on the moving platform and get off at the groud on the left. Keep going left, killing all creatures until you reach the red door. Go through it. You're almost there now. Note: You're bound to make more than one fault in this cavern. So have patience and don't loose your courage. Keep trying again and again until you suceed. Get onto the moving platform that you see up ahead and then from there jump onto the faster moving platform that is a little above that. From this platform you will be able to jump high enough to catch hold of the vine. Climb up and fall on the right. Jump up to the other vine and climb to the top. Fall to the right on the green slab and jump from one slab to other until you reach proper gound. Up ahead is the blue door. Go there. 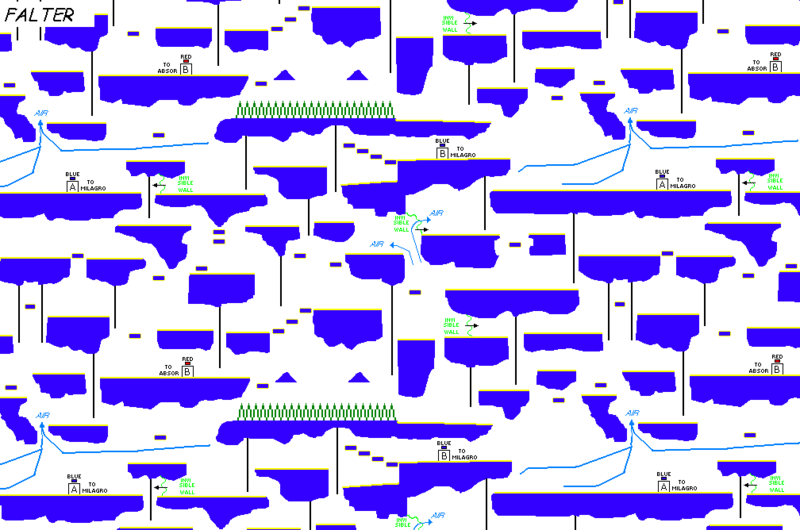 This is an easy cavern. This is the place where I love to use the Guerra power. Kills 'em all, leaving behing almas for the taking. Just take the key, located at the far right. Climb the vine and you are at the door to Alguien, Jashiin's last henchman. The townsfolk told you that Jashiin used his powers to give him eternal life. This doesn't mean he's invincible. It just means that even if you kill him and get the crystal and then die at Jashiin's hand or use a Kiouku feather to chicken-out, then you'll have to fight him again to get to Jashiin. He is a sort of a body-guard for Jashiin. Before going in, drink the potion hidden in the dead-end wall to your right. This giant bat uses a non-avoidable breath attack on you which doesn't do too much damage. About 3 Guerra's should be able to finish him, since that spell does massive damage. You can also jump about at hit him with the enchatment sword. You will get a blue potion when you finish him off. If you've got Chikara Powder you can use it to restore your Guerra's for your fight with Jashiin. Ok, go through the door. Got the 8th crystal. Just one bad guy and one crystal left to make my day! Go left. Get the key. Climb the vine. Open the door. Have a chat with Jashiin and finish him off!!!!!! My that last crystal sure is big! Hey, I'm back at Felishika's Castle. Make haste to beautiful Princess Felicia's room and let the 9 crystals restore her. Enjoy the ending sequence! What a shame, it turned out to be a tragedy. Ah, just one more thing. It's really a pity that this game was released back in 1990 and you guys finish after some 10 years! It wasn't that hard, was it? Anyway I'm just happy I was able to help you finish it. PS: Since writing that walkthrough, I have come to find out that Fin is actually quite appropriate to use here. Check out the Translations section for more details.